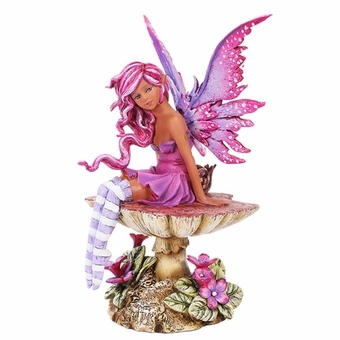 This bright fairy will add a splash of color to your home! 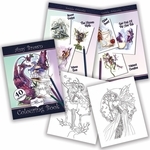 The pixie is based on artwork by renown fantasy artist Amy Brown. The little fae has pink and white streaked hair, and her matching wings and dress are violet and magenta. Flowers in the same bold hues bloom underneath the toadstool that the little lady sits upon. The perfect collectible for any friend of the faeries!